My Trio Rings offers services that help enhance our customers' shopping experience. From offering free 1 year Crafters Warranty, Ring Sizing Service, Engraving Service to a no-fee Layaway Plan, we have it all! Learn more about our different offerings so that you don’t miss out on any opportunities! Treat your rings to a world-class professional ring care service to help keep them sparkling for a lifetime. Sending in your rings for servicing is super easy and you won’t have to worry about any difficult requirements that may get your service plan voided! Personalize your rings by adding meaningful messages to let your significant other know how much they mean to you. From engraving anniversary dates to engraving each other’s initials, we can do it all! Having issue with your ring size? Resize your ring with My Trio Rings to ensure that you can wear it everywhere safely and comfortably. Like any jewelry, a ring is subject to the effect of wear and tear that will become visible over time. The Ring Polishing & Rhodium Plating service will renew the shiny finish and life of your beautiful rings. Tired of constantly aligning the engagement ring and the wedding band on your finger? With this service, the rings will be soldered together so that they are perfectly matching each other all the time. Specifically formulated to clean gold and diamond jewelry, the Ring Cleaning Kit will help you keep your rings in a like-new condition for longer at home! Did a diamond fall out of your favorite wedding ring? My Trio Rings will replace any side stone diamonds on your wedding band or engagement ring when you are past the 1 year warranty period. My Trio Rings takes great pride in the quality of our diamond jewelry and we will replace or repair any purchases that show signs of crafting defect within one year of the date you received your order. My Trio Rings is proud to provide free shipping on all US orders! We ship internationally - learn more about the different locations we ship to by visiting the link below! 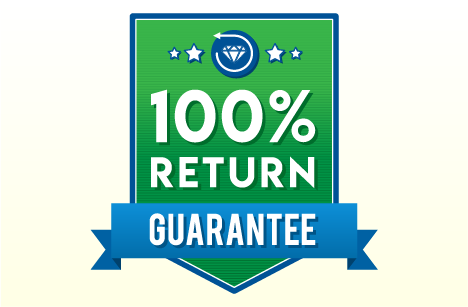 If for any reason you are not satisfied with your purchase, you can return the rings within 60 days from the date of receiving them for a full refund or exchange! Take advantage of our no-fee layaway plan where you can split up the payments into weekly, bi-weekly, or monthly payments. Once you have made all the payments, we’ll ship your rings out to you!